On the 30th June 2017, we hosted a huge crowd to our official office opening party. A great afternoon/evening was enjoyed by many of our clients, neighbours and colleagues. Luckily our new office has a full kitchen in the middle of it, which made catering for this night so much easier. It is also fortunate that we have a full size bath that we could fill up with drinks for the night. A new year brings even more new changes at Lidgerwoods Accountants. We happily welcome Kylie Sanders to our team as our Office Manager. She will be assisting Marc, Sophie & Louise to meet all your needs in the busy tax year ahead. Kylie is not new to our firm. She has been a client of ours for over 15 years, and brings a wealth of previous office management experience with her. We have again attached some articles to this newsletter – some of which will be relevant to everyone, and some that won’t, but still worth a read. “a fine is a tax for doing something bad, a tax is a fine for doing well”. We look forward to seeing you at our kitchen bench over the coming year. - extend the useful life of the website. 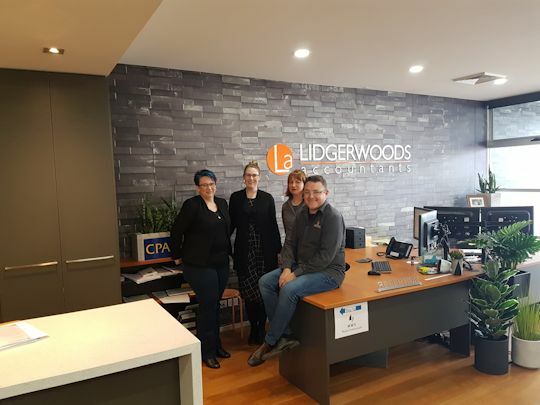 Editor: Please contact Lidgerwoods Accountants if you want any guidance about the ATO's latest views on this important issue that affects many business clients. Maisie and John, who are partners in a sheep station business located near Sydney, travel to Wodonga for the sole purpose of meeting with their tax agent to finalise the preparation of their partnership tax return. They stay overnight at a hotel, meet with their tax agent the next day and fly back to Sydney that night. Julian is a sole trader who carries on an art gallery business in Alice Springs. He travels to Wodonga for two days to attend a friend's birthday party and to meet his tax agent to prepare his tax return, staying one night at a hotel. In the circumstances, it is reasonable that half of the total costs of travelling to Wodonga, accommodation, meals, and any other incidental costs are deductible. Editor: Although the ATO's Determination directly considers the treatment of travel costs associated with the preparation of an income tax return, the analysis should also apply where a taxpayer is travelling to see their tax agent in relation to the preparation of a BAS, or another tax related matter. As a general proposition, for income tax purposes, interest income on a bank account is assessable to the account holders in proportion to their beneficial ownership of the money in the account. The ATO will assume, unless there is evidence to the contrary, that joint account holders beneficially own the money in equal shares. However, this is a rebuttable presumption, if there is evidence to show that joint account holders hold money in the account on trust for other persons. Adrian's elderly aunt has a bank account in her name, and Adrian is a joint signatory to that account. Adrian will only operate the account if his aunt is unable to do so due to ill health, but all the funds in the account are hers, and Adrian is not entitled to personally receive any money from the account. In relation to bank accounts operated by a parent on behalf of a child, where the child beneficially owns the money in the account, the parent can show the interest in a tax return lodged for the child, and the lodgment of a trust return will not be necessary. Raymond, aged 14, has accumulated $7,000 over the years from birthdays and other special occasions. Raymond's mother has placed the money into a bank account in his name, which she operates on his behalf, but she does not use the money in the account for herself or others. Raymond earns $490 in interest during an income year and, since he has beneficial ownership of the money in the account, he is therefore assessable on all of the interest income. However, as Raymond is under 18 years of age, he will be subject to the higher rates of tax that can apply to children. If Raymond shows the interest in his tax return for that income year, his mother will not need to lodge a trust tax return. Prior to the relevant legislation being passed into law, the outright deduction threshold for SBEs in relation to depreciating assets was scheduled to revert back to $1,000 as of 1 July 2017. Now that this change has become law, the threshold is scheduled to revert back to only $1,000 as of 1 July 2018. Editor: The ‘aggregated turnover’ threshold to satisfy the requirements to be an SBE taxpayer has increased from $2 million to $10 million, as of 1 July 2016. As a result, more business taxpayers than ever before will be eligible for the $20,000 immediate deduction for depreciating assets. The ATO is reducing the amount of information needed to be included in the business activity statement (or ‘BAS’) to simplify GST reporting. 1B - GST on purchases. This will not change a business’ reporting cycle, record keeping requirements, or the way a business reports other taxes on its BAS. Simpler BAS is intended to make it easier for businesses to lodge their BAS. It should also reduce the time spent on form-filling and making changes that don't impact the final GST amount. Small businesses can choose whether to change their GST accounting software settings to reduce the number of GST tax classification codes. Editor: Call our office if you need help with the transition to Simpler BAS or to decide whether your business will use reduced or detailed GST tax code settings in its GST accounting software. Up until 30 June 2017, an individual (mainly those who are self-employed) could claim a deduction for personal super contributions where they meet certain conditions. One of these conditions is that less than 10% of their income is from salary and wages. This was known as the “10% test”. From 1 July 2017, the 10% test has been removed. This means most people under 75 years old will be able to claim a tax deduction for personal super contributions (including those aged 65 to 74 who meet the work test). - The fund acknowledges the notice of intent to claim a deduction in writing. Broadly speaking, contributions to super that are deductible to an employer or an individual, count towards an individual’s 'concessional contributions cap'. The contributions claimed by an individual as a deduction will count towards their concessional contributions cap, which for the year commencing 1 July 2017 is $25,000, regardless of age. If an individual’s cap is exceeded, they will have to pay extra tax. Editor: We suggest you contact your financial advisor to discuss your exact circumstances before acting upon any of the information above. But this will now allow a lot more clients to claim a tax deduction for personal superannuation contributions should they wish to do so.